This is one of a series of posts intended to fully decipher Lord Byron’s lengthy poem, Childe Harold’s Pilgrimage. Childe Harold’s Pilgrimage — Canto I continues. The story so far: Byron, after traveling to Portugal and criticizing its dirty, slavish inhabitants, moves on to Spain. Oh, lovely Spain! renowned, romantic land! That dyed thy mountain-streams with Gothic gore? And drove at last the spoilers to their shore? While Afric’s echoes thrilled with Moorish matrons’ wail. 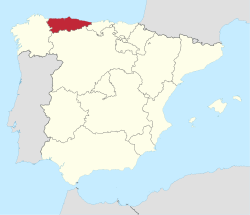 Asturias refers to an independent Christian kingdom that existed between 718 and 910 A.D. (the map below is the modern principality, but the terrority is nearly the same as the medieval kingdom). Asturias was formed by Visigothic nobles and officials who had been displaced by the Muslim invasion of Spain. The Visigoths elected Pelagio (Pelayo) as the first Asturian king. Pelayo is a legendary figure, serving as a leader and symbol of Christian resistance to the Moorish invaders. Cava’s traitor-sire = Count Julian. In 711 A.D. Julian allowed the moors to enter Spain. This was done out of vengeance against Don Roderick, who had violated his daughter, Cava. (Roderick, also spelled Roderic, or in Spanish Rodrigo, was king of Visigothic Spain). Teems not each ditty with the glorious tale? Ah! such, alas, the hero’s amplest fate! A peasant’s plaint prolongs his dubious date. See how the mighty shrink into a song! Can volume, pillar, pile, preserve thee great? When Flattery sleeps with thee, and History does thee wrong? This entry was posted in Byron. Bookmark the permalink.